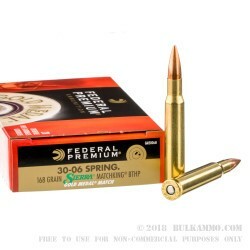 This 30-06 Spring cartridge from Federal Premium’s Gold Medal line of rifle ammunition features a precision-built 168 grain Sierra MatchKing projectile. The bullet’s thin jacket is drawn to a practically perfect concentricity standard in order to convey laser-like accuracy in flight. Its boat tail design reduces base drag to significantly increase its ballistic coefficient, lower its sensitivity to cross winds, flatten its trajectory, and deliver greater energy on impact. 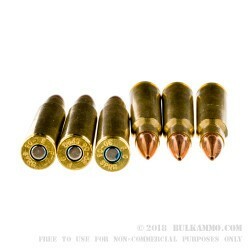 Finally, the bullet’s hollow point will cause it to expand rapidly upon impact with its target, which along with its 2,700 fps muzzle velocity will provide the debilitating wound channel you need to stop even the most tenacious buck dead in its tracks. 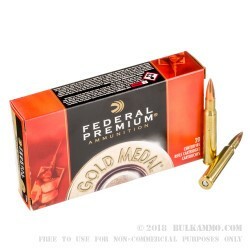 This round also offers an exclusive benchrest-quality Gold Medal Boxer primer with great sensitivity and consistent ballistics, a specially formulated clean burning propellant for optimal chamber pressures, and a fully reloadable factory fresh brass casing. 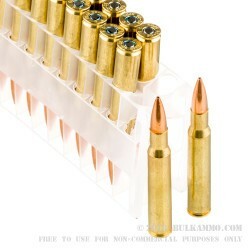 Q: Will these rounds work safely in my Sako 30-06 and my M1 Garrand? A: Yes, this FGMM 168gr load was originally designed for the M1 Rifle. It is also safe to use in .30-06 bolt actions.